Author: Chris Collins, Jeffrey S. Gruber †. Series edited by: Rainer Voßen. ǂHȍã is a (non-central) Khoisan language spoken south of the Khutse game reserve in Botswana. Some of the places where speakers can be found today are (from west to east): Khekhenye, Tshwaane, Dutlwe, Salajwe and Shorilatholo (and nearby cattle posts). It is closely related to Sàsí, whose speakers are found in eastern Botswana in Bodungwane, Dibete, Mokgenene, Poloka and Lethajwe (and nearby cattle posts). We group ǂHȍã and Sàsí into a group we call ǂ'Amkoe meaning “person” in both languages). In this grammar, we focus on ǂHȍã, but we occasionally give comparisons to Sàsí where we have the relevant data. We look forward to writing a full grammar and lexicon of Sàsí in the future. There is no exact estimate of the number of fluent speakers of ǂHȍã remaining, in part because they are scattered widely over various small villages and cattle posts, in part because there is no definition of what a “fluent speaker” is. In 2011, Chris Collins and Andy Chebanne established that there are at least 10 elderly fluent speakers in Shorilatholo. Similar pockets of speakers exist at other locations. We tentatively put the total number at 50, maybe a few more. The number of Sàsí speakers is similar. There are no young speakers of ǂHȍã or Sàsí left at this point of time. Overall, ǂHȍã has a very close resemblance to the northern Khoisan languages (e.g., Ju|’hoan, see Traill 1973, 1974; and Westphal 1974). Recently, Heine and Honken (2010) and Honken (2010) have claimed that ǂHȍã and the northern Khoisan languages form a group, which they call Kx'a. Therefore, we claim that ǂ'Amkoe is a branch of Kx'a. 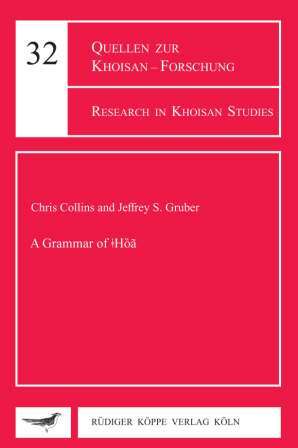 Collins and Honken (2012a, 2012b) claim that Kx'a in turn forms a group with !Ui and Taa on the basis of commonalities involving plurality and the linker, which clearly distinguish these languages from the central Khoisan languages. Vocabulary and oral texts of ǂHȍã shall be published as a further volume of “Research in Khoisan Studies”.